Friday July 1 was a sad day, because it was our last day in Israel. It started early...why sleep in on your last day in the country? I met Dave and Lisa at our bakery in the Jewish quarter. I had my cappuccino in hand when they walked in the door and then Lisa gave her tour guide commentary on the way back to the hotel. 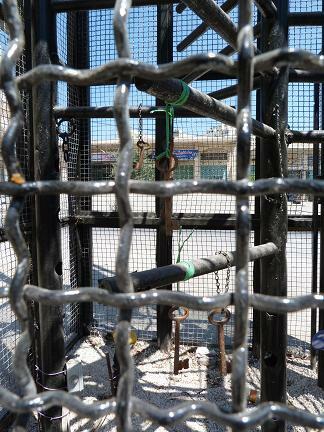 We started the day walking through the Damascus gate - the same gate I had walked through the night before. This time, though, there was a police presence. Why? It's Friday. The Muslim holy day and the start of the Sabbath. 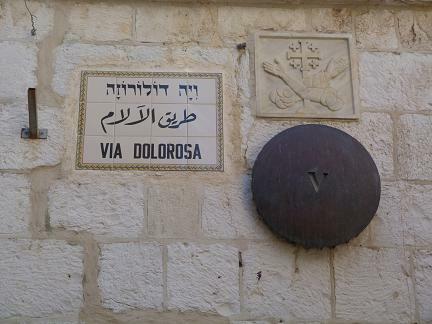 We started by walking the Via Dolorosa - the stations of the cross. Apparently now there are two Via Dolorosa, the traditional one and another used by Catholic pilgrims today. Why are there 14 stations of the cross? Because of the 14 generations mentioned in Luke and Matthew. 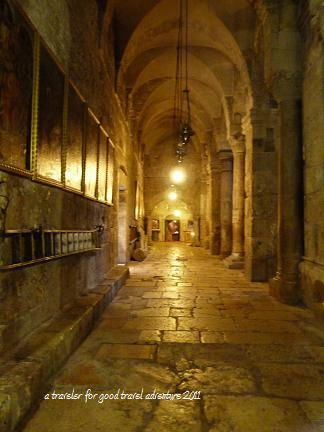 We finished at the Church of the Holy Sepulchre. 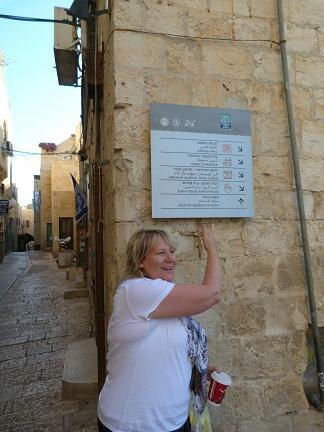 We started by going up the stairs to Calvary, where Jesus was crucified. Unlike the artistic Christian pictures you might see that imply that Calvary was a mountain, it was really about 100 feet up a rocky up cropping off the main street. Since crucifixion was capital punishment, they wanted the criminals above street level where everyone could see them. The church has 6 denominations present and they each maintain some portion of the church (and do not maintain anything that doesn't belong to them). Outside the church, I had my one moment of worry of the entire trip. 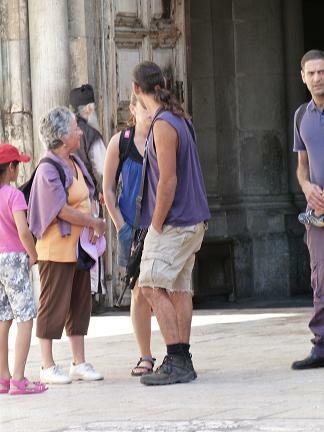 A random guy came out of the church and then took his machine gun back from whoever was watching it. It was loaded. I felt slightly better when he grabbed the hand of a child who must have been a part of his group. I felt even better when he went away. Our next stop was the refugee settlement of Dheisheh in Bethlehem. This was a refugee camp from the war in 1948 that has morphed into a full time permanent settlement. There were a little over 3,000 people living there in 1948, on less than a square kilometer of land, and now there are about 13,000. We got a tour of the camp from Shaeed (exact spelling unknown) who is very passionate about the plight of the Palestinian people. The fun part about walking through the settlement was the kids. They didn't like to be photographed, but they loved saying hi and practicing their minimal English, as well as playing hide and seek. To learn more about the camp and the Phoenix foundation (their cultural and recreation center) click here. Turnstile left from when there was a gate at the settlement. Keys symbolize the Right of Return for the Palestinian people. 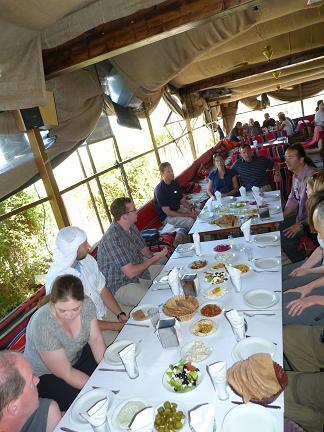 Our last group activity was our "Last Supper" our celebration lunch at a Bedouin style tent restaurant in Bethlehem called the Shepherd's Tent. 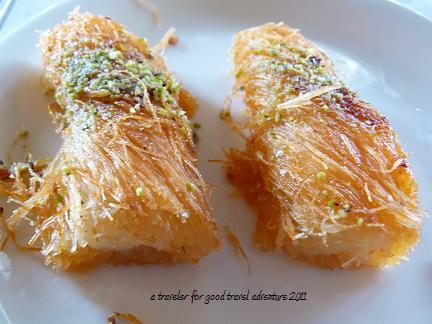 On the way we passed a bakery whose claim to fame was the Guinness World Record size Katayef (or Konnefeh) in the world. A giant pastry. What could be better? Peter actually stopped at another bakery along the way to the restaurant to see if he could find one for us. We lucked out that we were able to have it for dessert at the restaurant. At lunch we went around the table and everyone shared their best moments of the trip. It was fun to think about all the great moments in just 10 days of time. What's the best? The church service at Mt. of Beatitudes? Floating in the Dead Sea? Sailing on the Sea of Galilee? Standing on the ancient stairs? Everyone had a different memory. In the afternoon, we had time to pack, shop, nap, whatever. I had 40 shekels left to spend. Bought a bottle of wine, a soda and then one last cappuccino from the hotel that I drank quickly before we had to walk to the bus. 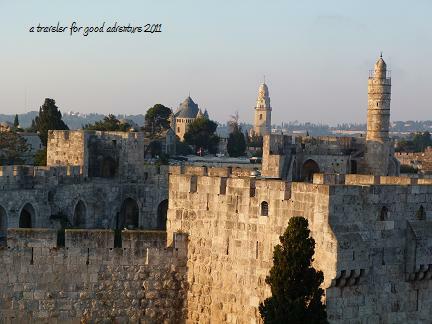 And that's where I end my reflections of Israel. It's never as exciting going home from vacation as it is going. 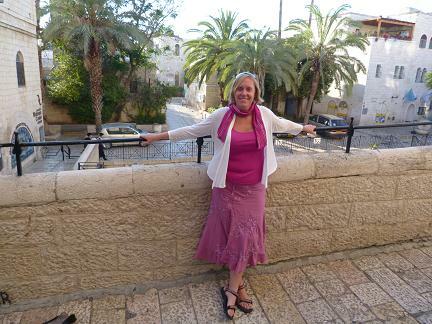 Hopefully these posts encourage you to experience Israel for yourself.